Videos of crosswind landings from Birmingham Airport in the UK are becoming more frequent, but they rarely disappoint. 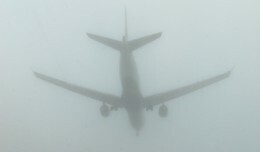 This one, posted by flugsnug, shows Flybe Flight 403 from Belfast enter a squall moments before touching down on runway 33 in a beautiful effect of swirling rain around its fuselage. Afterward, there is a fairly routine Turkish 737 go-around that is due to a 52mph gust. When the air is dry and a sheet of rain like that hits, there is usually a good downdraft and turbulence with it, but here, the atmosphere is likely nearly saturated. There many have been some additional turbulence from it, but the pilot probably didn’t notice with all the other wind velocity changes. Looking at it, there isn’t any noticeable increase in the sink, just unstable wind with unstable rain (sheets, steady, none). 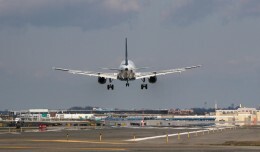 Though crosswind landings are routine, controlled and safe, they always entertain. Phil Derner founded NYCAviation in 2003. A lifetime aviation enthusiast that grew up across the water from La Guardia Airport, Phil has a background in online advertising and airline experience as a Loadmaster, Operations Controller and Flight Dispatcher. You can reach him by email or follow him on Twitter. 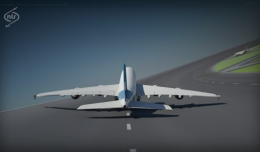 A report from the BBC about a circular runway concept is going viral, but how does it hold up when examined objectively? Columnist/Pilot Justin Schlechter shares a story of flight crew really earning their paychecks, as the the autumn nights over Alaska bring some challenges in their 747 at the end of a long Pacific hop. 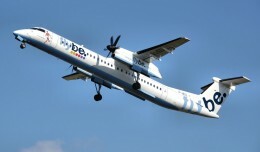 Low-cost airline Flybe said on Wednesday that it intended to cut 300 jobs to slash costs. 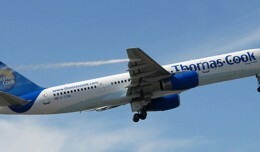 A Thomas Cook 757 sprung a serious fuel leak while departing Turin, Italy, and photographer Paolo Migliavacca was there to catch it.